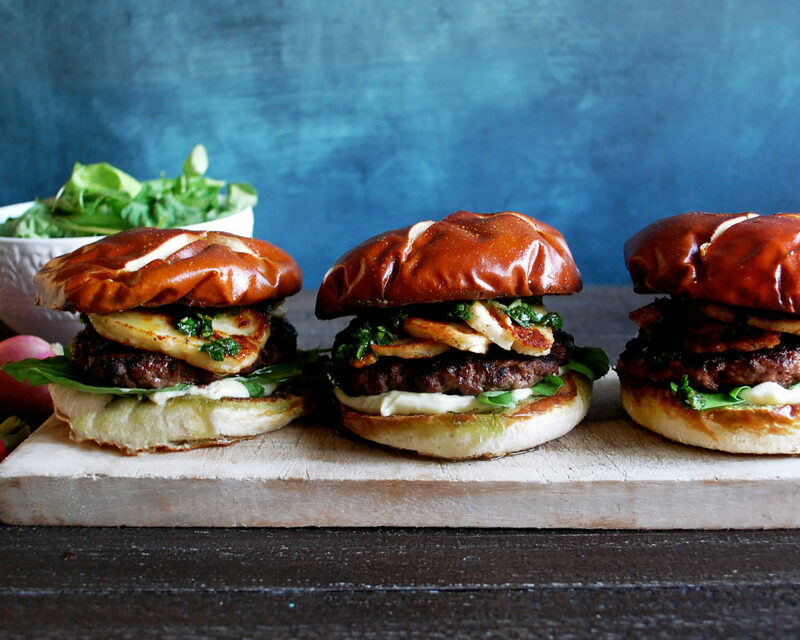 It’s Memorial Day weekend, and that calls for really good burgers. This is honestly the burger of my dreams. 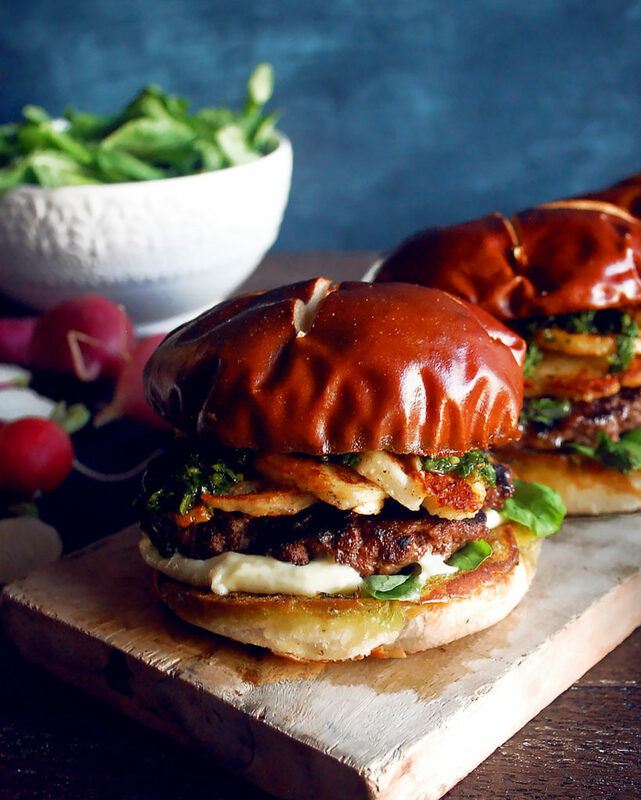 Not only because it’s got fried halloumi cheese, which I discovered last year at an event in Napa and absolutely fell in love with it, but also because I’ve layered a ton of flavors to make this burger something pretty special. So, tomorrow’s Memorial Day, and if you’re like me, you love to grill. 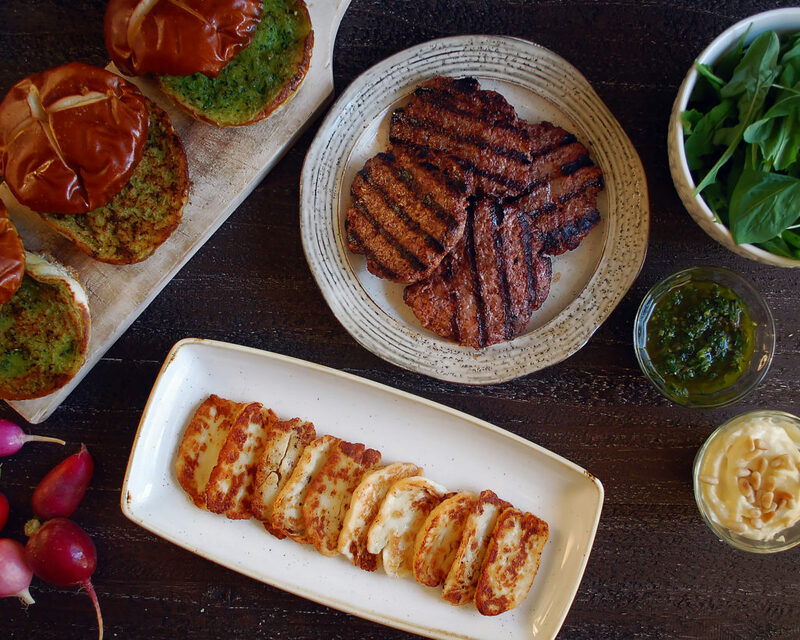 The weather is finally gorgeous, and it just feels right to open the grill and start heating things up. While I do love a traditional burger, you know exactly what you’re going to get with it. The flavors are usually the same if you add lettuce, tomato, ketchup, and any other classic fixings. I wanted to do a few things different, as usual, and this combination of flavors turned out pretty amazing. The first layer is a pine nut mayo. I make a traditional mayonnaise and simply blend in lemon juice and pine nuts at the end. If you’ve toasted your pine nuts well, the flavor really comes through in the mayo. It’s super intriguing, richly nutty, and makes for a great spread on toast as well. If you’ve never made homemade mayonnaise, the trick is to blend the egg yolks extremely well before beginning to add any oil. The yolks should become thick and pale. From there, it’s crucial to add the oil very, very slowly. Adding the oil too fast will cause your mayo to break. Making mayonnaise is one of those simple techniques that just needs a lot of patience and some practice. But, I love the flavor and texture of making it yourself, so I’d say it’s worth it. 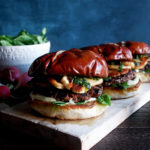 Moving on, I add some arugula to the bun for a peppery bite. So much better than watery iceberg lettuce. Then comes the meat. I use ground chuck (75% lean). I like to keep the meat simple, with just a seasoning of salt and black pepper. With a simply seasoned beef patty, the flavors of the other components come through better. Next up, the halloumi cheese. And let me tell you, this stuff is good. Halloumi is a semi-hard, brined cheese made from a mixture of goat’s and sheep’s milk. You can usually find it in a log, and what’s great about it is that the cheese has a very high melting point. This allows you to cook it without losing its shape. I like to take the log, slice it into thin pieces, and sear it in a pan of hot oil. It creates this beautiful golden crust, and when you bite into it, the cheese is warm, gooey, and has this rich flavor that is out of this world. 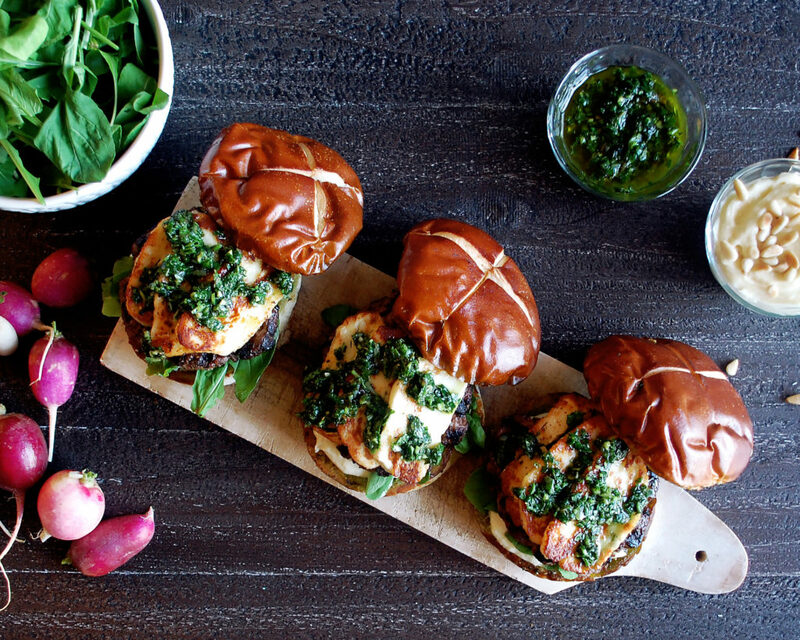 If the cheese wasn’t enough, this burger gets one more layer of flavor…a grilled ramp chimichurri. It has garlic, parsley, acid, and tons of smoky flavor from the ramps. It’s such a vibrant topping with so much flavor. Ramp season is unfortunately just about ending (it’s only about a month or two long). So, if you can’t find ramps, you can substitute with green onions. And that is basically it for these burgers. I use pretzel buts because I love their flavor, kind of rich and salty. I also had some leftover ramp butter on hand from this Sweet Pea & Roasted Fennel Agnolotti dish I made the other day, so I softened it and spread it onto the buns before grilling them for a few seconds to toast. Definitely try these out for Memorial Day, or really any day! I hope you love them as much as I do. Enjoy! Preheat the grill over high. Clean the ramps, dry them, toss them with oil, and grill them whole. Once charred and tender on all sides, remove the ramps from the grill and season with salt. Roughly chop and let cool a few minutes. In a food processor, combine the ramps, garlic, and parsley. Pulse until all the ingredients are coarsely chopped. Transfer the mixture to mixing bowl. Whisk in the sherry vinegar, lemon juice, and olive oil. Season with salt at the end. Set aside. In a food processor, add the egg yolks. Blend for 1-2 minutes, until the yolk is pale in color and has thickened slightly. Begin to slowly drizzle in the oil, very slowly. If you add the oil too fast, the mayo will break. After incorporating about ¼ of the oil, drizzle in a touch of ice water. The water will help emulsify the mixture. Continue to alternate slowly adding oil and water. Use as much water as you need, being careful to not add too much. Soon, the mixture should begin to thicken. After adding all the oil, the mayo should be thick, pale, and creamy. Blend in the pine nuts, lemon juice, and salt. Pulse just until smooth. Refrigerate until ready to serve. Slice the log of halloumi cheese into thin slices, about ¼ of an inch thick. Heat a sauté pan over medium heat. Add a generous amount of oil to coat the bottom of the pan. When the oil is sizzling, add the cheese in an even layer. Don’t overcrowd the pan. Depending on the size of your pan, you may have to work in batches. After 2 minutes, or when the cheese is golden brown, flip each slice and brown on the other side. Transfer the cheese to a plate. Serve warm. Place the ground beef into a mixing bowl. Season with a generous amount of salt and black pepper, mixing well. Form the beef into six (¼ lb) patties. 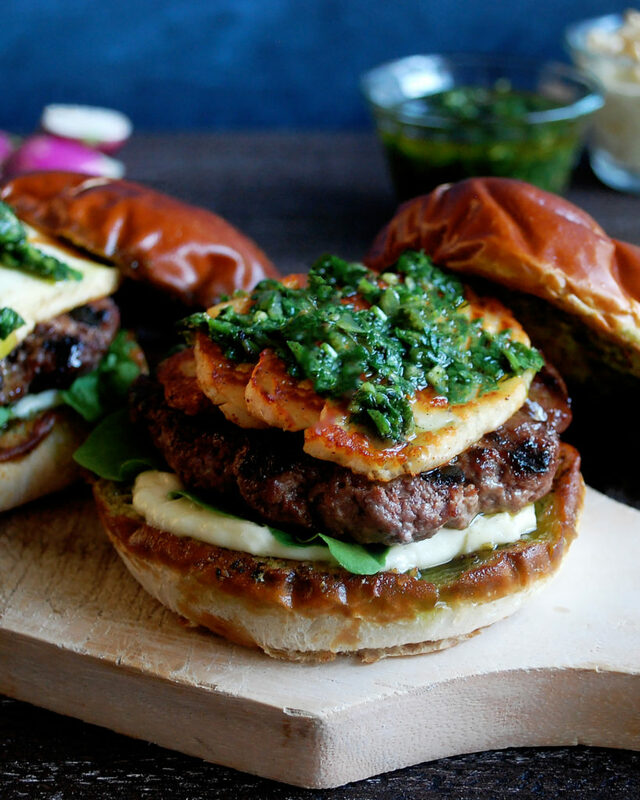 Lay the patties out onto a sheet pan. Make a small indent in the center of each patty. Grill the patties until your desired doneness. I like to start the burgers on the hottest side of my grill until they have a good sear on both sides. I’ll then transfer the burgers to the cooler side of the grill so they can slowly finish cooking. Slice the buns in half, if they’re not already sliced. If using, spread softened ramp butter onto the inside of each bun. Toast the buns on the grill. If not using the ramp butter, you can use regular butter, oil, or simply toast them dry. Spread the pine nut mayo onto the bottom bun. Add a small handful of arugula. Place the burger on top. 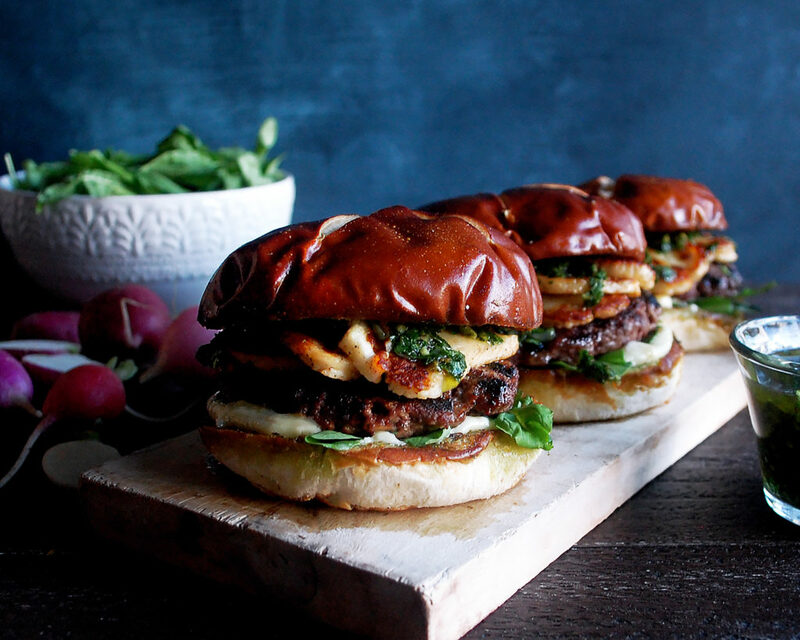 Lay a few pieces of halloumi cheese onto the burger. Finish by spooning the ramp chimichurri on top of the cheese. Close the burgers and dig in. 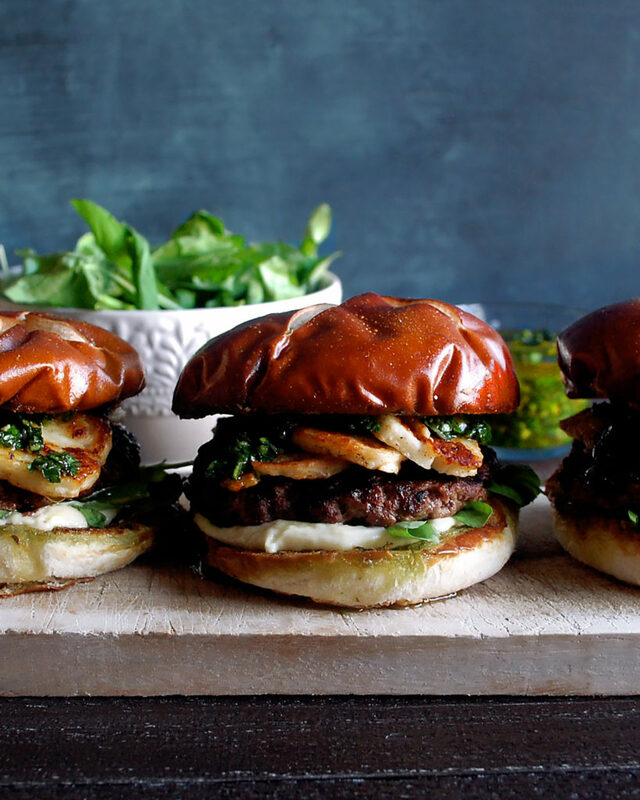 You can easily increase the amount of ground beef, halloumi cheese, arugula and pretzel buns to make more burgers. 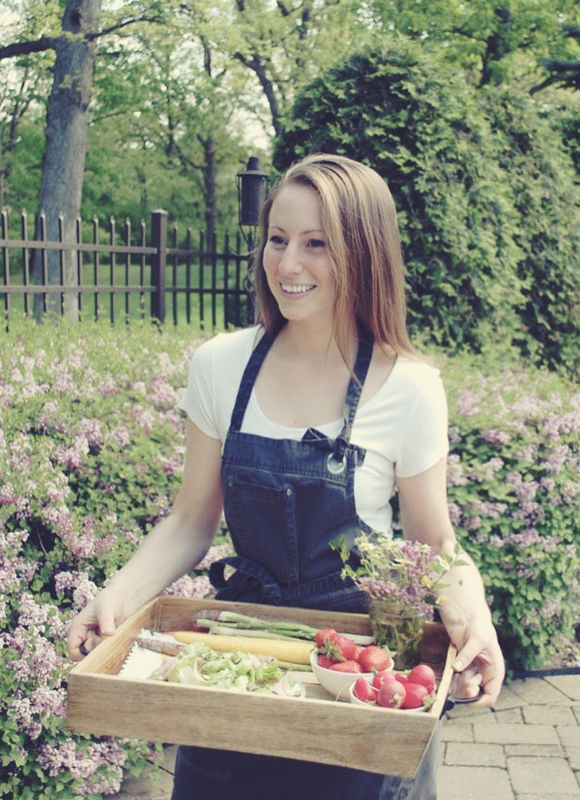 There will be plenty of chimichurri and pine nut mayo.